Born around 1603 in Amiens, Picardy, Jean de Quen was about 17 years old when he joined the Jesuits. He was designated a missionary to New France, and disembarked in Québec on August 17, 1635, four months before the death of Samuel de Champlain. An explorer despite himself, Jean de Quen was the first European to see Lake Piékouagami (Lake Saint-Jean). Upon his arrival, Jean de Quen taught at the Québec college, a “petite école” opened that same year for French and Amerindian boys. In 1637 he was at the Sillery mission, whose purpose it was to convert and instruct the Aboriginal peoples and teach them a sedentary life. A little later he was back in Québec where he divided his time between the parish of Notre-Dame-de-la-Recouvrance and the college. After a fire destroyed the school, chapel and Jesuits’ residence in 1640, he resumed his service in Sillery before venturing on to the Trois-Rivières post, where he was involved in the establishing another mission. In the summer of 1642, he devoted himself to the evangelization of the Montagnais of Tadoussac, where he was to remain for some ten years as the leader of the mission. Since at least the turn of the 17th century, Tadoussac had been a trading site that attracted not only Amerindians from the north shore, but also those from the Gaspé and Lake Saint-Jean. Probably at ease among the Natives, Jean de Quen earned their trust, particularly that of the inhabitants of the Saguenay. No one – whether French, Basque or British – had as yet officially explored the entire length of the Saguenay. No one had seen the great lake that appeared on a map produced in 1544 by geographer Jean Alfonse. De Quen was to succeed in the having himself taken there by the people of that country, who as Victor Tremblay points out, “avoided letting the white men know about […] Lake Saint-Jean and the inland route to the Saguenay”. There is nothing to indicate that the Jesuit ever wanted this voyage. No doubt he simply expressed a desire to visit the members of the Porcupine nation who were prevented from coming to Tadoussac because of disease. He left the Tadoussac mission on July 11 in a small bark canoe. 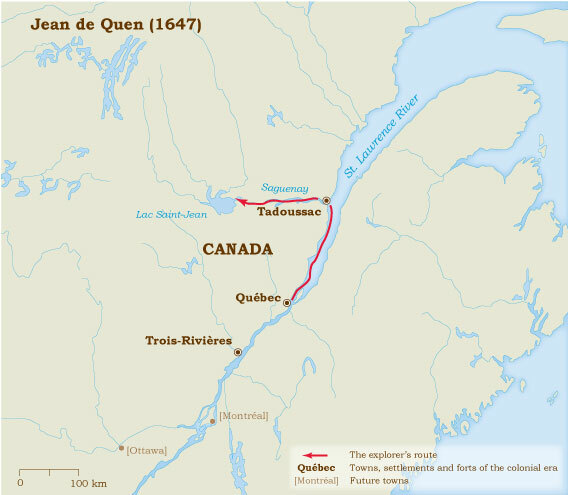 Victor Tremblay summarizes the itinerary of Jean de Quen and his guides as follows: they went up the Saguenay to Chicoutimi, and took the river of the same name as far as lakes Kenogami and Kénogamishish. The group then must have entered Lake Saint-Jean via Belle-Rivière, a waterway which the missionary does not mention. “So large is this lake that one can barely see its shores; it appears to be round in shape, and is deep and full of fish: pike, perch, salmon, trout, goldfish, whitefish, carp and a number of other species are fished there.